When share prices are expected to rise moderately, the protected covered write can be used to generate income, while eliminating the risk of a large potential loss on the stock. The strategy consists of holding stock, writing a call option with a higher strike and buying a put option with a lower strike. The maximum profit at expiry is the difference between the stock price at the time of entering the strategy and the strike of the call, plus the net credit received from the sale of the call and purchase of the put. 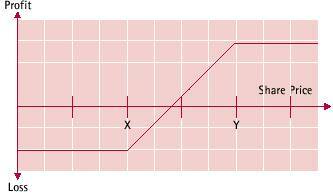 The maximum loss occurs if the stock falls to the level of the put. The loss is equal the to the difference between the stock price at the time of entering the strategy and the strike price of the put, less the net credit received from the options. 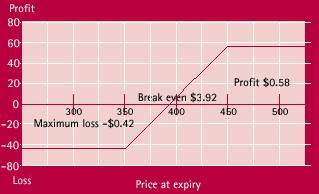 The potential loss with this strategy is limited because the stock can always be sold for the strike price of the put. Although an unexpectedly strong rise in the share price will not result in a loss, there is an 'opportunity cost'. This is because the investor will be required to sell their shares at the exercise price of the call option. Strike price: when choosing which option to sell, the trader must balance the income to be earned against the level at which they will be required to sell their shares. Similarly when choosing which put option to buy, the investor must balance the cost of the put with the level of protection required. Typically, an investor sells an out of-the-money call and buys an out-of-the-money put, providing the opportunity to sell their shares for a profit and, at the same time, removing much of the downside risk. The protected buy and write/covered write is popular with investors buying stock on margin as much of the downside risk of owning the stock is eliminated through the purchase of the put. The strategy can be viewed as insuring the stock with a put financed either wholly or in part with the proceeds from the written call. Stock bought on margin through certain margin lenders can be lodged with ACH as collateral for the written calls on a one for one basis. In the event of getting exercised on the short call (stock is sold) only the put remains, which would normally be sold as it is no longer required for protection. Be sure that you are happy with the price you will obtain for your shares if you are exercised. Given the possibility the options will be exercised, be sure that the premium received is adequate. XYZ shares are trading at 4.00. In order to insure the stock at 3.50 you buy the 3.50 put for 8 cents. To pay for the put option you decide to write an out of the money 4.50 call option at 16 cents per share.